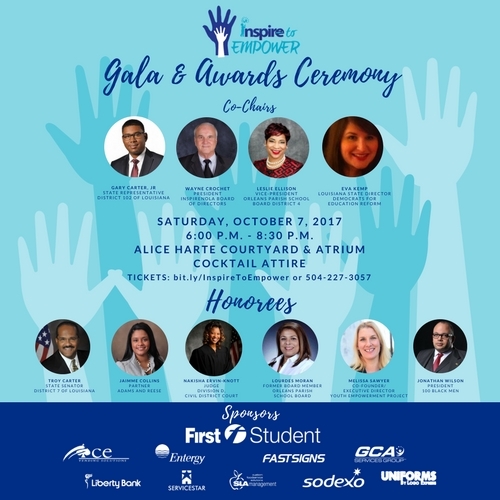 InspireNOLA will also be honoring six outstanding individuals who have made significant contributions to the community by empowering groups or individuals within New Orleans. This year’s honorees are: Troy Carter, State Senator, District 7 of Louisiana; Jaimmè Collins, Partner, Adams and Reese; Nakisha Ervin-Knott, Judge, Division D, Civil District Court; Lourdes Moran, Former Board Member, Orleans Parish School Board; Melissa Sawyer, Co-Founder/Executive Director, Youth Empowerment Project; and Jonathan Wilson, President, 100 Black Men. We hope that you will join us and support us for this inspiring event! For tickets, visit bitly.com/InspireToEmpower!